Here we are at the penultimate week six of car announcements coming to Forza Motorsport 7 and we’re shining the spotlight on a truly unique batch of cars. The Forza world fell in love with the custom built special models that debuted in Forza Horizon 3 and we’re pleased to say that Forza Edition cars, as they’re now known, will be a part of the fun in Forza Motorsport 7! These cars feature unique styles designed to catch the eye, but also custom tuning and special bonuses that will make them must-own additions to every Forza player’s garage. In Forza Motorsport 7, Forza Edition cars will be immediately recognizable on the track. Whether they’re sporting custom widebody kits and wheels or gorgeous liveries, Forza Edition cars will always stand out from the crowd. Beyond the aesthetics you can only find in a Forza Edition car, you will get a ride that has been fine-tuned by the experts here at Turn 10, who have considered every factor from power-to-weight ratio, to the specific suspension settings that will make a Forza Edition car a top choice for all types of four-wheeled-fun, including special built-to-drift models. Not only do these cars look great and drive well, but Forza Edition vehicles also offer advantages to progress your career and increase your credit balance. Each Forza Edition vehicle has built-in multipliers that will enhance your credit reward for racing and winning with it, as well as increase the XP gained while you are behind the wheel. These are tools of your racing trade that will deliver a big payoff, race after race. So how do you get your hands on these amazing Forza Edition cars? In addition to being available as rewards in game, via the Forza Drivers Cup single player campaign or in #Forzathon events, you’ll also be able to find them on the Auction House, which is returning for Forza Motorsport 7. 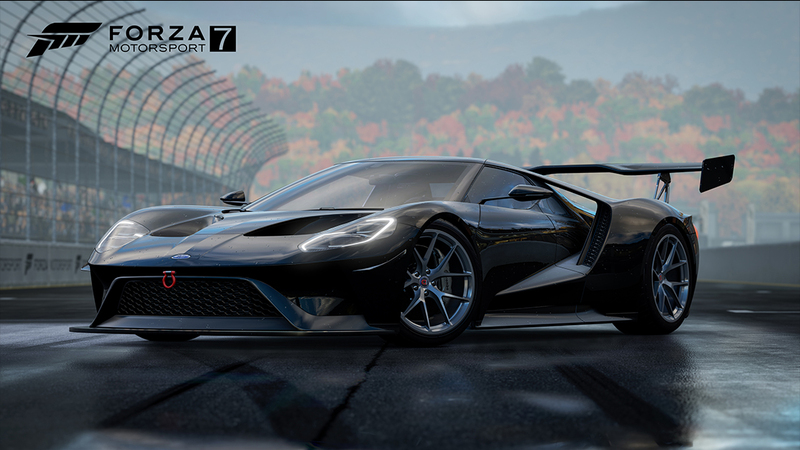 Now check out at what happens to the incredible Ford GT when it becomes a Forza Edition car. The Ford GT was created to fulfill the most auspicious destiny in the world of motorsport – claiming victory at Le Mans. Marking the 50th anniversary of the original Ford GT 40’s victory, the new Ford GT was built to prove that Ford can still dominate at the highest level of sports car racing. The production model GT is the starting point for homologation from which endurance racing provenance is borne. Take one look, or one listen, or one drive, and the character of a champion is obvious. Throughout the carved aerodynamics and gloriously sculptured form, players will find active elements and static design that create not only unique allure, but massive downforce. Within, technology abounds in adjustable suspension and drivetrain settings that put 647 EcoBoost twin-turbo driven horsepower to the massive rear wheels. Ford Performance set the bar high when they reinvented the GT, and of course both destiny and expectations were exceeded with not only the victory they sought, but the awe of the lucky 1,000 owners who are lucky enough to own them. The complete list of Forza Edition cars is still growing, so stay tuned for more details on these amazing and highly beneficial cars and trucks! As always, stay tuned to ForzaMotorsport.net for the full list of Forza Motorsport 7 cars revealed to date. Now here is the entire list of vehicles we have announced so far.